You may remember from last year, I offered this free printable coloring page. I decided this would also make a lovely embroidery pattern! You may click HERE to get this free printable. The bunny in this pattern measures 4 1/2 inches high and 4 3/4 inches wide. It seemed a bit snug for a 5 inch hoop so it would be best fitted in a 6 inch hoop. 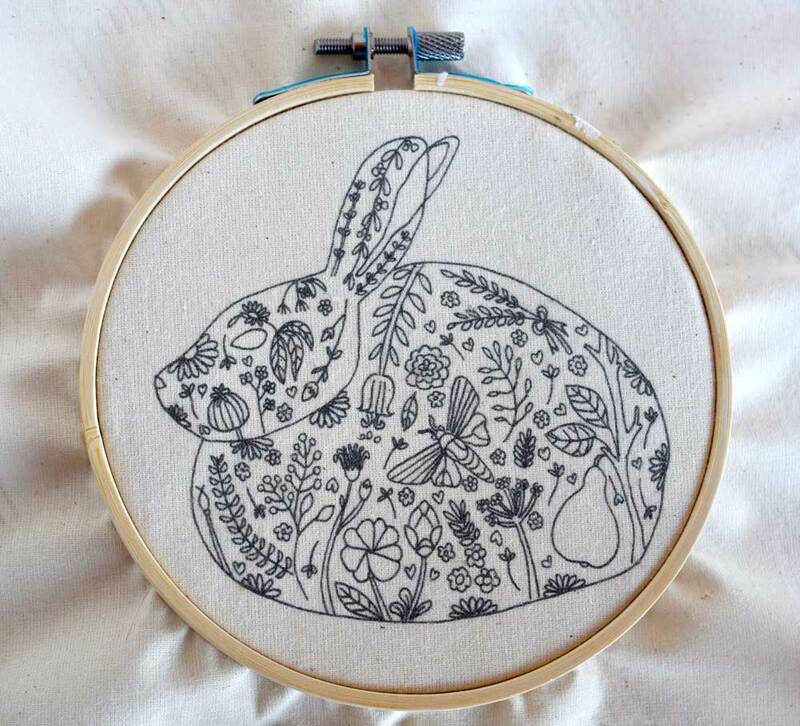 I re-sized just the bunny to fit perfectly into a five inch hoop. 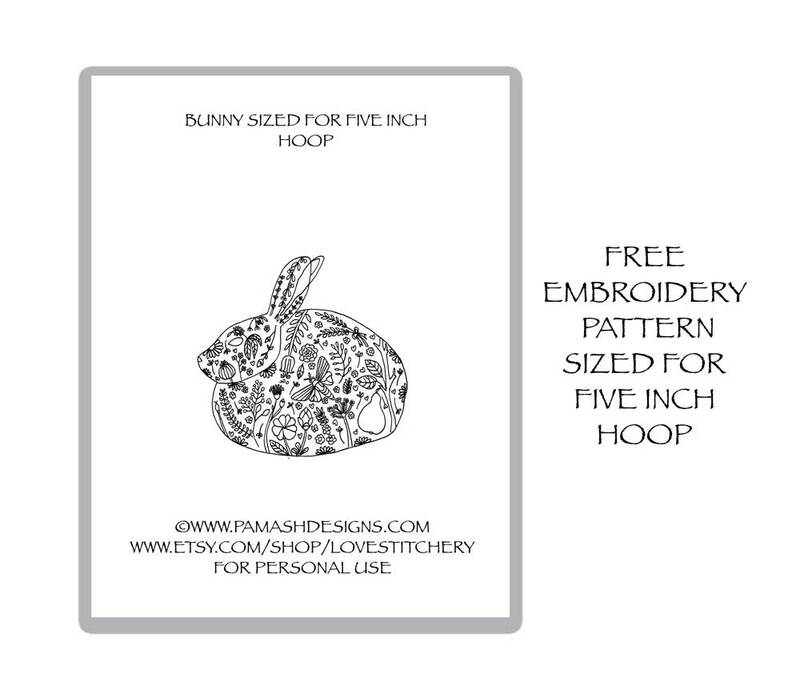 Click HERE to get the 5 inch sized bunny. You can click on any of the above stitches to find the tutorial on how to make them. 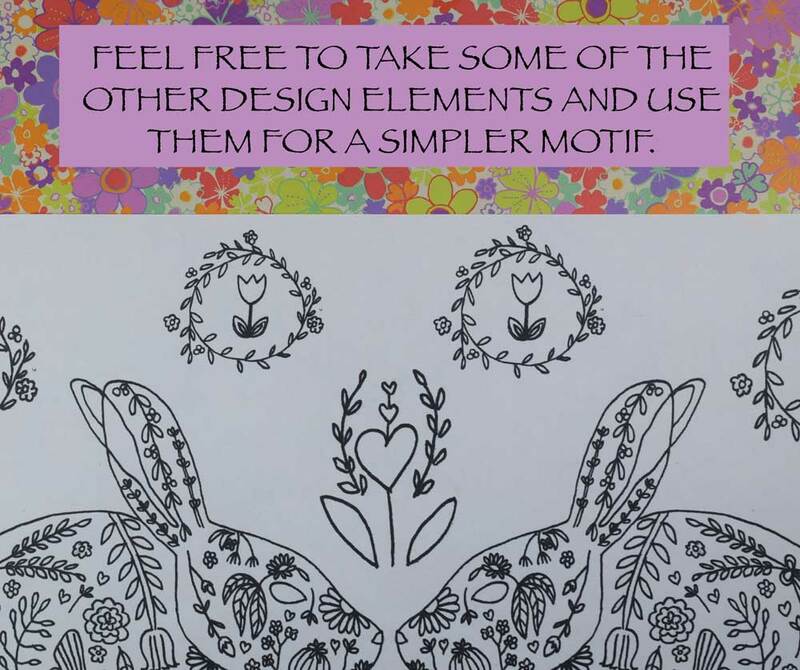 Included with some of them are free printables which could also be used as embroidery patterns to practice on. All the stitches used are beginner stitches but it is kind of a detailed design so when you are finished you will have a very elegantly, detailed piece. You can choose whatever color palette you desire. I started out using spring pastels and then changed my mind in the middle to use a monochromatic scheme on a turquoise background and was so pleased with the results. I would love to try some bright colors on a black fabric. I'll walk you through how I completed this project. This is just a guide but please feel free to add your very own stitches, colors and creativity to make this your own! First transfer your pattern to the fabric you are going to use. The least complicated method is to tape the printed pattern onto a bright window with painter or masking tape. Next tape the fabric over the pattern and simply trace. You can use a washable fabric marker or just a sharpened pencil. To see an example of this method click HERE. I like to print the pattern right onto my fabric using my home printer. I use fabric spray adhesive to attach the fabric to a piece of 8.5 x 11 card stock. I then neatly trim around the edges using a rotary cutter and straight edge and it prints beautifully on light colored fabric (See picture above.) The only down side with this method is that you can not wash the marks off when you are done so there is a risk you will be able to see the pattern under the stitches. It doesn't bother me too much and sometimes it's much faster than tracing :) For surface embroidery a simple cotton fabric is great. You may wish to choose a light color to make the pattern easier to trace. The above example was printed on unbleached muslin (called CALICO in some other countries.). If you wish to transfer the pattern onto a dark fabric see two methods explained HERE. Once you have transferred you pattern, center it inside a 5 inch embroidery hoop. Now comes the fun part! Choose your color scheme. I prefer to use DMC six stranded thread. For most of this design I used two threads since the design is so small and detailed. Experiment and see what you like. For some of the really small design elements (like the hearts), you may just want to use one thread. ***TIP for smaller curved areas, use less threads and make your stitches a lot smaller. 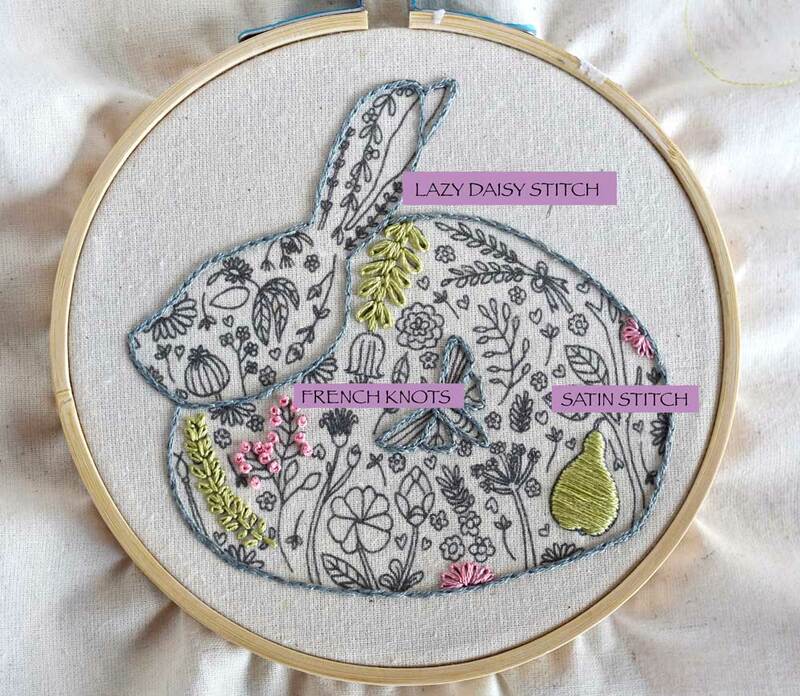 I started by outlining the bunny and the butterfly inside the bunny using the split stitch in two threads with a gray color (169). I brought in a few more spring pastel colors: green (3348), blue (827), pink (3326), and purple (210). For anything leaf-like, I used the lazy daisy stitch. Some of the leaves are quite small and intricate so feel free to use one thread. I used two threads for the whole project. For anything round, I used french knots. For larger areas to fill, like the pear, I used the satin stitch. A close-up of the stitching. Now I decide to do a complete about-face. 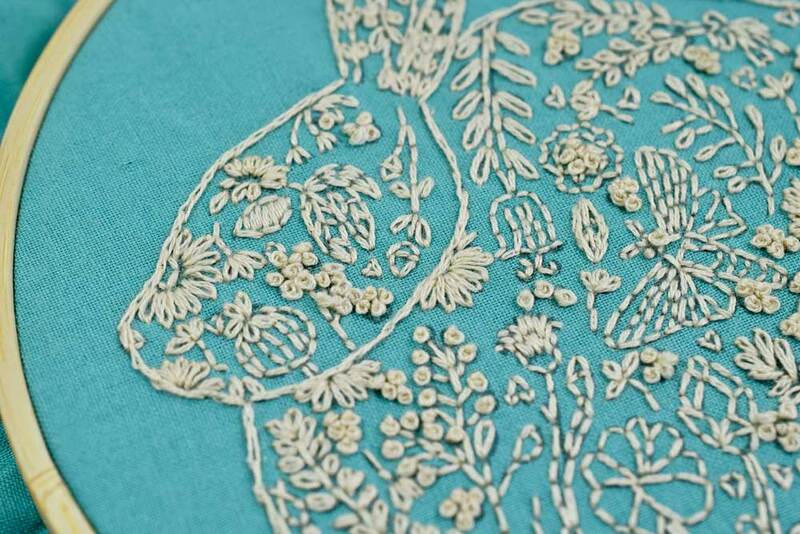 I change the background fabric to this delightful turquoise-ish and use a creme color thread. I love the effect. I used a lot of backstitch to outline the flowers, the butterfly, and some of the larger leaves. 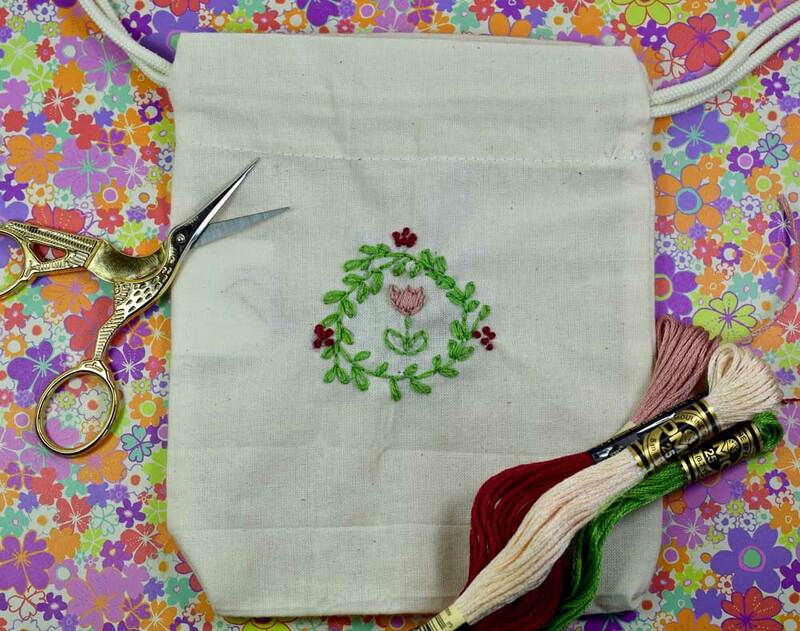 There were some tiny five petaled flowers that I completed all in french knots. I loved the satin stitch for the pear with a backstitch around it. Despite the fact that these are all relatively simple stitches when you step back it looks much more complicated. I added the bow at the bottom for a little extra cute factor. This would be a nice touch to add to your spring decor. It can be hung on your wall right in the hoop. Just slip a ribbon through the hardware at the top to hang it up. This would look great sewn onto a spring tablecloth, table runner, or even a sweet spring towel/dishcloth. Use them for APPLIQUÉ. Looking for something a little simpler? These little tulip and heart wreath designs are so sweet and really simple to sew up quickly. This delicate little muslin bag cost less than a dollar. It is completely transparent, making it really easy to trace the design onto the bag. Pick a few of your favorite colors and you can sew this up in no time. Here is the other design on the back of the pouch. These would look so cute on the cotton t-shirt like a baby onesie or on the bottom of your jeans going around the ankle. How about on the collar of a white button down shirt? If you enjoyed this free pattern, please feel free to peruse my shop HERE for more unique and original designs. Hand sewing is so relaxing and when you are done you have a lovely keepsake to hang on you wall or to make a statement with some wearable art. Happy almost spring to all of you!